Open Europe: Westerwelle's Future of Europe report - worth getting excited over? Westerwelle's Future of Europe report - worth getting excited over? 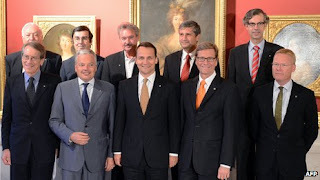 The so-called ‘Future of Europe’ reflexion group of eleven European foreign ministers, set up by Germany's Guido Westerwelle, to discuss and propose ideas on organisational and structural change in the EU held its closing meeting on Monday. Yesterday it released its final report and conclusions, the broad thrust of which is that, to emerge from the crisis, Europe needs more economic and political integration. In terms of the economic and fiscal side, the majority of the proposals in the document have already been agreed or proposed, such as the “reinforced economic governance framework” – i.e. the fiscal treaty and a single supervisory mechanism for eurozone banks. Even the possibility of making the ESM into a fully-fledged European Monetary Fund has already been voiced. Furthermore, these proposals will only apply to eurozone members and any non-euro members who participate voluntarily. A more “streamlined and efficient system” of EU governance which could include a directly elected Commission President, a European Parliament with the powers to initiate legislation and a second chamber for the member states. As stated above, there is significant momentum for more integration in economic, fiscal and banking affairs, but its hugely unlikely to spill over into foreign policy which exists in a parallel political sphere. This is simply a way to re-state the long-standing German desire for a Europeanised foreign policy (the practical difficulties of which have been made clear many times, most recently over Libya). Super-QMV for treaty change won't happen either - not least since Berlin itself would block it if push comes to shove, as would Paris - unless they would be willing to risk - for example - QMV on the European Parliament's second seat in Strasbourg. Banking union, and calls for EU treaty negotiations to be opened by 2014 - as called for by Barroso in his 'state of the union' speech last week - is where the story is at. The context for this whole initiative is effectively German domestic politics. While no one can question Guido Westerwelle’s European credentials, he is arguably one of the most side-lined Foreign Ministers in the whole EU, and the Future of Europe group is a way for him to show he's still a player. For Merkel this serves as a useful exercise at a time when the German government is über-sensitive to accusations that it is not sufficiently ‘pro-European’ - but without actually having to do anything. Finally, it is worth contrasting the lofty idealism of such - and similar - proposals with the cold, harsh realities of public opinion. As we reported on Monday, support for the EU and the euro has hit an all-time low in Germany, in France a majority of those surveyed said that given the opportunity now, they would vote against ratifying the Maastricht treaty, while the EU debate in the Netherlands is also become more complex. The main reason why Mr Westerwelle is the most side-lined foreign minister in the EU is because German EU policy is officially handled by Ms Merkel. A few years back as a consequence of the Lisbon Treaty the responsibility for EU topics was moved from the Foreign Office to the Chancellery. Then there of course other reason like his lack of support from his own party and the German public. Proposals like this need to have wider publication in the UK. Much of this thinking and proposals by Barroso regarding a "Federation of States" would assist the public to make a decision about the UK's future in the EU. Nothing for the British to worry about here. It will never happen, and if it does happen it will never work and it will fall apart. Even if it does happen and it doesn't fall apart, we won't be part of it. At least, we won't be part of it until we become part of it some way down the line. Ooen Europe should stop their insidious policy of trying to lull the British - in particular - into a false sense of peace and harmony when the forces of a Federal Superstate are on the march, not just in this paper but in all the proposals from the Commission in the last week. You say "Some of these proposals certainly pose a challenge for Britain. However, many of them have almost no chance of going ahead, certainly not in the immediate future. " The saying that "Rome was not built in a day" applies equally to the United States of Europe. The idea that we should let other countries - or worse the bureaucrats in Brussels - have any say at at all in our foreign or defence policies is totally shocking. Theses ideas can only have got this far since the Franco-German axis know they will be in the driving seat. The Commission already has too much power and should be stripped of many of its functions. To take away national vetoes on Treaty changes reduces participating former countries to subsidiaries of the Commission. You talk about the brake imposed by public opinion! But - excuse a cynical laugh - since when has the EU ever paid any attention at all to public opinion? The Irish people have vetoed treaties and been made to vote again. The Dutch and the French both rejected the constitution so the EU merely changed its title to the Lisbon treaty and to their shame went ahead. The fact that you can be complacent about this says more about the true objectives of Open Europe than it does about the EU itself. I am worried about your integrity. Well said Christina. There is no room for complacency. We should be very scared. We should be ready to take decisive action. The thing is not working, and the idea is more of the same, much more. Again it will be advanced by deception, it will be accepted by the slimy creeps that we vote in to rule us, it will become a fait accompli or, as they are called, Acquis Communautaire.. Eventually it will lead to war, civil or other, as in the collapse of the USSR. We do not want to be their Chechnya. We need strong acytion; and soon. From the postings of Average Englishman smd Rollo I feel I am not alone in expressing dismay at the complaisance and even the complicity of Open Europe in a planned monstrous stitch-up. @Christina We always enjoy hearing your thoughts. Our main point here is that some of the ideas in Westerwelle's paper don't enjoy the same kind of momentum for more EU integration, as is the case on financial / banking policy. Not even remotely, in fact (particularly foreign policy). Other ideas are outright fantasies (QMV on treaty change). Where there are challenges for the UK is in the area of banking and economic integration - we've consistently flagged up those risks and proposed ways to deal with them. Thanks to O.E. for that reply. I agree that some of the ideas are wild BUT Germany France were in on the Paper . They are far too influential to be ignored. The mad ideas may not be immediate but it is utterly clear that THAYT is their ultimate aim. And now today you post:-" Open Europe’s Mats Persson is quoted in Swedish magazine Fokus, saying that there’s an integration logic to the euro that “is hard to stop once the project is underway.” Thanks for that - a great help. I do NOT think. I think the EU has a lot of hurdles to overcome before these prposals could be enacted . The Euro is effectively the core of the apple and it is completely rotten . Whatever the optimism of incompetent European leaders , Whilever so many countries are bankrupt or have debts that their GDP is hard put to match , there is no way forward . Economic growth is across the board at a standstill . A single federal state would largely be paid for by Germany . I don't see the German people letting it get that far . The EU would be a bankrupt state , with zero internal economy , civil war would follow or an all out WWIII , with support of Al Quaeda and other terrorist groups , as in Syria now . Is the crisis starting to get to Juncker? Has Draghi really saved the universe?